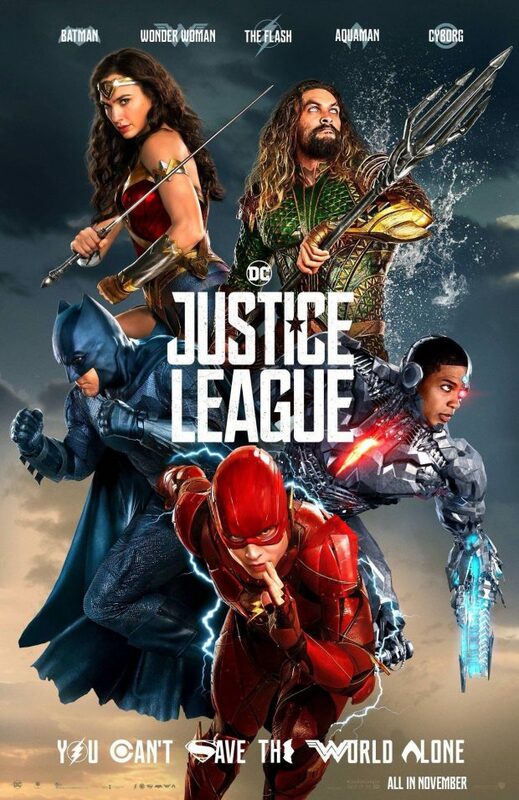 DC brings together their own team of superheroes to stop an alien threat before it can wipe out all life as we know it in Zack Snyder’s Justice League. After the monumental success of Marvel’s shared cinematic universe experiment everyone else has been rushing to create their own with limited success. DC had all the ingredients of a shared universe ready to go with their various superheroes the trick was building something that people actually want to watch. Up until now their efforts have been met with mixed reception by critics and audiences alike with Man of Steel criticised for its cavalier approach to widespread destruction, Batman V. Superman: Dawn of Justice criticised for being overlong as well as dour in tone -among other things- and Suicide Squad being torn apart for doing so many things wrong. The only acclaimed film in this franchise was this year’s Wonder Woman and that film seem to have set the tone for everything else being made from then on. Justice League was already deep into production when Wonder Woman came out so some really hasty alterations were made to build on what audiences were positive about in that film. Couple that with Zack Snyder exiting the project after the suicide of his daughter meaning that Joss Whedon stepped in to finish the film and you have a very troubled production schedule. I won’t go into detail here because the behind the scenes troubles that plagued this film are well documented but I felt it was important to touch on it as this knowledge may well have coloured my opinion of the film though I’d like to think it hasn’t. My reaction to the DC Expanded Universe -the official name for their shared cinematic universe- has been fairly mixed. I love Man of Steel, like parts of Batman V. Superman: Dawn of Justice, really dislike Suicide Squad and adore Wonder Woman. My reviews of three out of four of those filmed are linked above if you want to know more the but point I’m making is that I’m not expecting an effort from DC to be bad; I hope every film I see will be good and that I will enjoy it so I was actually really excited for Justice League because I’m a fan of the characters from the comics and really looked forward to seeing them all come together on the big screen for the first time. The plot is really simple. Earth is home to three MacGuffins known as Mother Boxes that can reshape the planet when brought together. A CGI creation voiced by Ciarán Hinds named Steppenwolf wants to get his hands on the Mother Boxes and the only people able to stop him are a group of brightly coloured costumed heroes. As villains go Steppenwolf is among the most forgettable. He’s not a character in any sense of the word. His motivation is simple though perhaps too simple and he has all the depth of a bad Saturday morning cartoon villain. Comparisons to villains like Skeletor are inevitable and valid considering the execution of this villain. With the right focus his presence could have been terrifying but the film has no real interest in developing this character beyond “obstacle the Justice League need to hit”. Thankfully this means more attention is given to our small band of heroes. Ben Affleck returns as Bruce Wayne aka Batman; freshly inspired after witnessing the death of Superman (Henry Cavill) to form a team with the purpose of defending the Earth. Joining him in his recruitment drive is Diana Prince aka Wonder Woman (Gal Gadot). 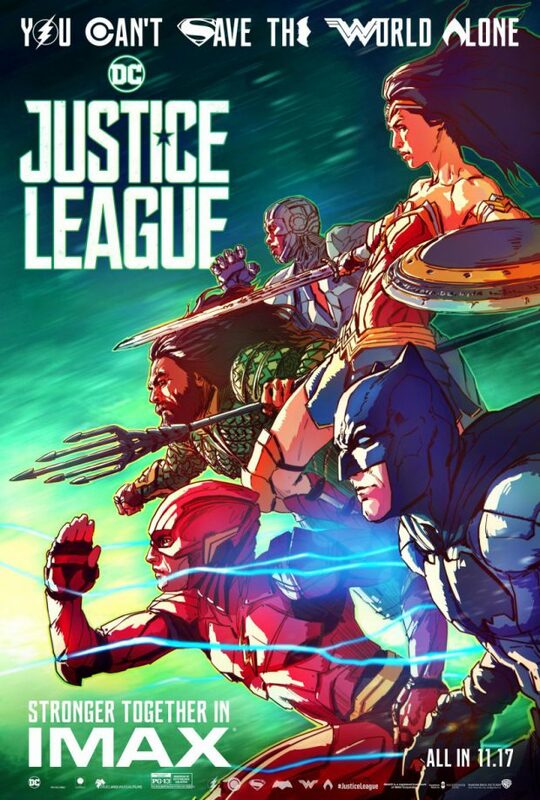 Together they recruit Barry Allen aka The Flash (Ezra Miller), Arthur Curry aka Aquaman (Jason Momoa) and Victor Stone aka Cyborg (Ray Fisher) to form the Justice League. Of these characters only Bruce and Diana have had films to develop them as characters so a vast chunk of the running time is spent offering context to the others. Their origins are briefly established as well as their personalities and their dynamic with the others to varying degrees of success though it averages out as fairly well done considering the fact that the amount of characters and the need to keep the plot moving. The plot itself moves at a reasonable pace but feels rushed though never slows down enough to be boring. Many of the scenes feel like a tick box exercise to get the necessary information across before moving on. The film clocks in at around 2 hours including credits so the rushed nature of the plot isn’t really a surprise when bearing that in mind but it means that much of the detail is lost as a result. Scenes like Bruce’s first meeting with Barry or Diana’s attempt to recruit Victor could have been better with a lot more time to breathe. Taking more time to establish character dynamics outside of the world ending villain plot would have benefited the film greatly. In terms of tone I was far more comfortable with this than I was with other films in this franchise. It’s light and fun throughout which is definitely the right thing to do for a superhero team-up movie. Much of the dialogue is sharp and quippy which could be a result of the talented hand of Joss Whedon writing at least some of it though I doubt that everything good about this film can be solely attributed to him. The problem with the tone is that it isn’t nailed down as well as it could have been so it often feels like there is no real jeopardy. Everything is brushed off as if it’s a bit of an inconvenience rather than the end of all life on Earth which can definitely neuter the narrative. Still it’s a step in the right direction and has potential for future outings. I found myself warming to every member of the team in one way or another. Bruce is far lighter than he was in Batman V Superman and is no stranger to a joke which adds a lot more range to the character. Affleck plays him as authoritative yet compassionate which works well in his role as team leader. Diana is as charming as she was in her own film with a mini arc involving her becoming more comfortable working with others and stepping out of the shadows. Ezra Miller is constantly watchable as Barry Allen. I’m -sometimes- a fan of the TV show so had reservations about accepting a different Barry Allen but Miller completely proves himself. He’s quirky, socially awkward and is the most human member of the team. He’s the only one who admits to being scared and gives the impression that he feels in way over his head though this is tempered by his innate desire to do the right thing. This is a character I want to see more of so hopefully I will get my wish. Jason Momoa’s Aquaman is also a lot of fun. Momoa has screen presence to burn along with excellent comic timing that comes into play at several key points. It’s clear that Jason Momoa is having a blast playing this character and there are hints of more to him beneath the surface -pun intended- ahead of his solo outing due out next year. Ray Fisher’s Cyborg is a character I liked a lot though the handling of him to be very all over the place. Cyborg is clearly something that was changed a lot in the reshoots as his personality shifts significantly between scenes. Part of his character is that he is constantly changing but those changes don’t have an obvious through line so it just comes across as unfocussed. Ray Fisher does a fine job and that definitely needs to be said but his character was done something of a disservice. There will be much speculation about Henry Cavill’s role in the film and it’s not something I’m going to spoil in this review. I think I’m justified in admitting he’s in the film because he is featured in one of the trailers but I won’t gointo great detail. I will say that he is used really well for the most part and brings a version of Clark Kent aka Superman that I personally prefer to see. Visually the film is inconsistent. Much of it looks great with several action sequences that look and feel like they are very well put together but others feel completely rushed and the CGI ranges from great to terrible. Considering how much money was spent making this film the poor quality of many of the visuals is inexcusable. As if that wasn’t bad enough sometimes terrible CGI will interrupt a beautifully rendered sequence therefore distracting from the overall experience. Sadly the film feels like it was rushed to get into cinemas but could have been vastly improved with more time to fine tune the visuals. One thing that absolutely has to be discussed is Henry Cavill’s upper lip. Reshoots for this film meant that his moustache would be digitally removed to keep his appearance consistent with the scenes already filmed. Most people will be wondering if you can actually tell and I definitely could. It’s not a simple case of looking for it because I know that it’s there. It’s very obvious and looks hilariously bad to the point his cartoonish upper lip is a horrifying distraction whenever it makes an appearance. More work was definitely required. An enjoyable if uneven experience that signifies a step in the right direction for the future of the DC movies. The villain is among the most forgettable ever seen in a modern superhero movie and the film suffers a lot in the execution of the visuals. Bad CGI plagues this film constantly and distracts from the overall experience. The various hero characters are handled well with a good cast that bounce off each other well though the rushed nature of the plot leaves little time for them to interact outside of the plot. This film adopts a very light tone which allows it to be a lot of fun though sometimes leaves it lacking in any meaningful sense of jeopardy.